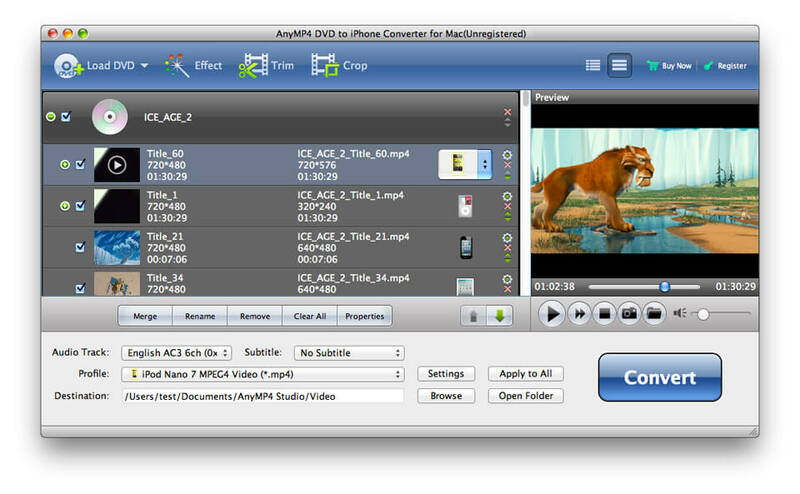 AnyMP4 DVD to iPhone 5 Converter for Mac 6.1.28 無料ダウンロード - Rip/Convert any DVD to iPhone 5 MP4, MPEG, and MOV, etc. on Mac. Moreover, this Mac DVD to iPhone 5 software can also provide you with some powerful editing functions to help you customize the video effect. So you can trim the video length, crop video frame, merge video clips into one and add text/image watermark to the video, etc. AnyMP4 Mac DVD to iPhone 5 converter can help iPhone 5 users convert any DVD to iPhone 5 compatible video formats on Mac. Also, it can extract audios from DVD and convert them to iPhone 5 compatible audio format such as MP3, M4A, WAV, etc. You can choose to order one-year or life-time free upgrade according to your needs. Once connected to the Internet, this software will automatically detect if there are new upgrades available. AnyMP4 DVD to iPhone 5 Converter for Mac has a built-in player that can help you preview the video effect. Also, you can capture your preferred picture and save it as an image file. With this software, you can adjust the output parameters such as Video Bitrate, Resolution, Encoder, Frame Rate, Aspect Ratio, Audio Encoder, Bitrate, Sample Rate and Channels according to your needs. You can use AnyMP4 DVD to iPhone 5 Converter for Mac to choose your preferred audio tracks and subtitles if the DVD has. This software supports 5.1-Channel audio. AnyMP4 DVD to iPhone 5 Converter for Mac can play all kinds of DVD movies on the Apple devices like iPhone, iPhone 4, iPhone 4S, iPhone 5, iPad, iPad 2, iPod, iPod nano, iPod touch and Apple TV, etc.